We are back with another edition of Parental Guidance, where I play games with my parents and they let me know what they thought of my choices. This is all part of my never-ending search for games I can play with people who aren’t part of my usual gaming group. While we’ve always got the old standbys like Ticket to Ride or Catan, eventually you can get tired of playing those. With this article series, I’ll let you know what games I chose and why, and my mother will chime in to let you know how good of a choice it was for non-gamer. Note: Mom’s comments are her own, anything in (parenthesis) are my comments. In this two player only game, the Holmes brothers are out to prove who is the greater detective. The game is played over seven rounds (days), and at the beginning of each day, a new character from the books of Arthur Conan Doyle appears in London to help the players. 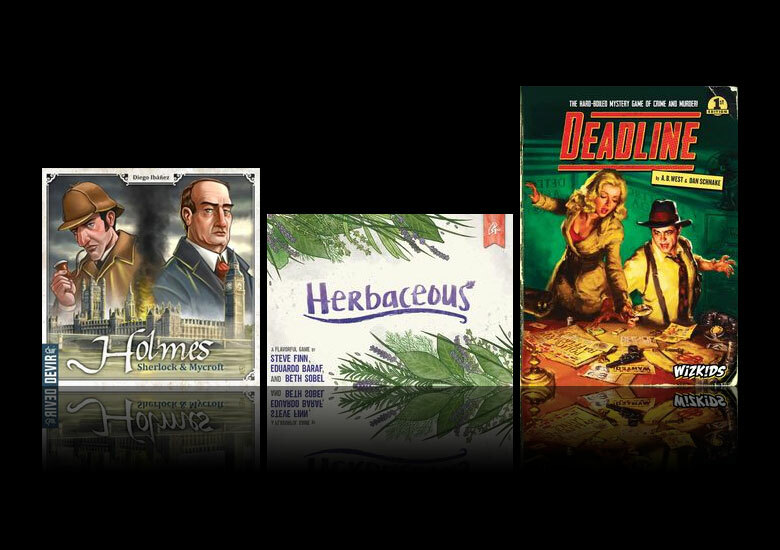 In practice, Holmes: Sherlock & Mycroft is a set collection game where players get three actions per day, and use the characters to convert resources into cards for their sets. I was actually given a copy of Holmes: Sherlock & Mycroft as a gift and I’m glad I got it. I’m always on the lookout for 2 player only games, and this one was an instant hit for me. Overall it’s easy to learn and plays at a good pace. The only down side is that the icons on the cards aren’t always the most intuitive, but as only one new card is revealed each round, it’s easy enough explain what the new character does. I liked the twist to the scoring too (hidden cards). I also liked that during the 7 days, new people cards were introduced so you didn’t know what your options were going to be right until they were revealed. Although I’m not sure why it’s a Sherlock Holmes game, since you don’t do anything with the mystery (theme is pasted on), I’d buy this one to play again, I thought it was a fun 2 player game. A very light and easy to learn card game where players are planting herbs in their garden. The game play in Herbaceous is super simple: play cards into your private and communal garden, and possibly pot some herbs in one of your four planters. It’s set collection mixed with a little press your luck. Knowing my parents were avid gardeners, I thought that they would easily gravitative to the theme. The game is also easy enough to learn so I knew we could get to playing right away. This one is probably just a bit too long for a filler game, but I figured as a light game, they might enjoy how quick and unique it was. Another one with really nice artwork. I guess I notice games with nice artwork after all those years of playing card games that have just numbers and symbols on them. 🙂 This was my favorite of the three. It was easy to learn, quick to play, and didn’t require a lot of brain racking thinking. It was mainly deciding the best time to take the cards and plant them in your garden. I learned the hard way about waiting to long to take the cards from the community garden and lost points because the other player grabbed the cards before my next turn, costing me points. One player did add his points incorrectly (Dad), which would have cost me the win by one point if I didn’t call him on it! Since the scores can be close, maybe use a double-check system with the scores. I add, you check my math. A game themed around the old film noir style, players must work together to solve a mystery, usually a murder. I’ve described Deadline to people as a mashup between The Grizzled and Sherlock Holmes Consulting Detective. It combines some hand management with story-based investigation. You choose a clue card, then players have to play matching icons into a pattern. If they can get all the needed icons on the table, they solve the clue and can read the information on the back of the card, which will usually lead to more clues and/or info about the cases. This was one of my surprise hits this year and I’ve played over half the included cases already. I love murder mysteries and the hand management aspect was a nice way to break up the game play and keep things interesting. So far, everyone who I have played this with has enjoyed it. While I wasn’t sure if the game length would be too much for my parents, it’s definitely something they haven’t played before, so fingers crossed that they would like it. I enjoyed this game for the first 45 minutes, after that, I was ready for it to be over. The clue cards that you would get after the round was over were too vague and hard to remember. We had to keep reading them after the rounds to figure out what we knew so far about the crime. I would limit it to no more than 10 clues with more meat on them. I did like that all 4 of us were working together to solve the crime. I think I would try this one again, but with only 2 players to see if it moves any faster or play it when I have a more time to dedicate to it.